Sai Baba Sansthan, Shirdi Trust has introduced an Online Darshan Booking for Sai devotees which are providing them an option of not standing in a line for several hours to have darshan of Sai baba Samadhi Mandir to pay their respect. Those who register online will not have to stand in the darshan queue for more than an hour. They will be told the estimated time when they can pay their respect and will be able to finish their visit within an hour. The devotees sitting at their home can also watch live darshan on television. Shirdi Sai Live Darshan is broadcast from Shirdi Sai Baba Samadhi Mandir is scheduled between 4 a.m. – 11.15 p.m. (Indian Standard Time). Baba has promised “I shall be active and hearty even from the tomb,” and in the Mandir that we can most fully practice the happening of Sai Baba and the amazing way he has touched the hearts and lives of millions of people from all over the globe. Baba’s presence is felt when one has Baba’s look, when one sits at Baba’s feet. 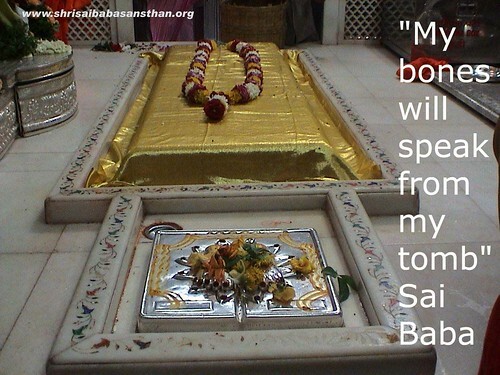 Sai Baba’s Samadhi Mandir is the place where sacred body of Baba is resting in Samadhi. The articles handled by Baba are sealed & displayed here in a special showroom. All rituals like Pooja, Abhishek & daily four Aartis are performed here. The Samadhi Mandir of Shri Sai Baba was actually owned by a millionaire from Nagpur and a famous Sai devotee Shreemant Gopalrao is also known as ‘Butti Wada’. He wanted to keep an idol of Murlidhar there. According to the myths, Sai Baba manifested himself as Murlidhar and the temple became the Samadhi Mandir of Baba. It is built on some land that Baba had tended as a garden. Now that his grave is here and Baba is receiving so many devotees it seems that he is development plants of a different nature and still sowing seeds. The Samadhi of Baba is built with white marble stones. The railings around it are full of ornamental decorations. The idol of Baba is an eye-catching statue made up of Italian marble built by Late Balaji Vasant in 1954. The temple has an assembly hall for about 600 devotees. The first floor of the temple has the pictures depicting the life of the saint. The temple opens on 5 AM with morning prayers and close down at 10 PM with night prayers. The daily routine of the temple starts at 5 o’clock in the morning with Bhoopali, a sunup song and closes at 10 o’clock in the night after the Shejarati is sung. Only on three occasions the temple is kept open overnight on Guru Poornima, Dussahera and Ramnavmi. Every Thursday and on each festival a Palakhi with Baba’s photo is taken out from the temple. Shri Sai Baba came to Shirdi with a marriage revelation. Lord Sai baba stayed at Dwarkamai till the very end of his life. Dwarkamai is situated on the right of the entrance of Samadhi Mandir. Here Sai baba solved problems of the people, cured their sickness and worries. Before Baba’s arrival in Shridi, Dwarkamai was an old mosque in a falling down condition. Baba turned it into Dwarkamai and proved that God is one. The first level of Dwarkamai has a sketch of Baba and a big stone on which Baba used to sit. This level has two rooms. One contains the chariot and the second a palkhi. Just in front of the room where the chariot is kept is a small temple. A saffron flag flies over it. The second level of Dwarkamai has a square stool made of stone which Baba used for taking a bath. The main attraction of this place is the oil painting of Shri Sai Baba sitting in a fixed wooden shrine. This level also has the grinding stone and the wooden vessel called Kolamba in which Baba used to keep the Bhiksha brought from the village. The work was begun around 1915. It was built in stone and was known as dagadi or stone. The day that Baba took Mahasamadhi on Tuesday 15 October in 1918 was a very important day o for Hindus, it also happened to be the Muslim month of Ramzan. October 15 was the Hindu festival of holy Vijayadasami, a few minutes into ekadasi. After the first aarti of the day, an abhishek (bathing of the statue with milk, water, curd and ghee etc) is performed. Devotees may sponsor the abhishek by contacting the Sansthan. Visitors may also donate cloth for Baba which will be wrapped around the statue. All the cloth that Baba has worn is put on sale in the Sansthan shop. Many people like to buy cloth that has been blessed in this way and use it. Muslim followers as a saint. Some of his Hindu devotees believe that he was a sign of Shiva and he was regarded as a sad guru and an incarnation of Kabir. Baba means as “father” used in Indian languages. Sai Baba taught moral of love, forgiveness, charity inner peace, devotion to God and guru. Shirdi Sai Baba is worshipped mainly in Maharashtra, Karnataka, Andhra Pradesh and southern Gujarat. Sri Sai Baba left his body in October 15 in 1918. Sai Baba gives answer of the devotees in his own way. Shirdi Sai Baba will answer your questions. You can ask him for the solution to any of your problem and look for his direction to proceed further. Shirdi Sai Baba gives the answer in hard and clear terms and to the point. Think of your Problem to be solved & look for Baba’s Help. A Number will come up in your Mind. The Answer comes up in the next page… where Shirdi Baba gives Crisp & Clear answer. Shirdi Sai Baba is our beloved Guru God & everything. Always shall be there when we need him, only in different forms & avatars. Millions of People have benefited from Sai Baba Miracle. Baba has helped millions of people by answering their question. People who never believed him earlier have started to believe him. A devotee of Shirdi Sai Baba is use of this procedure to look for Baba’s answers to their problems. honour. Baba of Shirdi is also known as Sai Baba. Sai Baba was an Indian guru, yogi and fakir who are known by his devotees as a saint. It is believed that at the age of 16 years Sai baba came at the village of Shirdi and remained their till his death. He found shelter in Khandoba temple. Baba spent his early days at Shirdi under a neem tree and later lived in the masjid named as Dwarkamai or Mother Dwarka. He was an equal of religious belief for Christian, Hindu and Muslim. Sai Baba himself led the life of a severe, he advised his followers to lead an ordinary family life. Shri Sai baba of Shirdi lived between 1838 and 1918. He lived in a mosque and after death his body was kept in a temple. Sai baba philosophy is ‘Shraddha’ meaning faith and ‘Saburi’ meaning sympathy. According to Sai Baba Shraddha and Saburi were the ultimate attributes to reach the state of religiousness. Sai baba of Shirdi lived a very simple and sober life, sleeping on the floor of temple and later taking a mosque as his shelter. He came to Shirdi and he began exhibiting a fascinating attraction among people as they began follow to him. He is recognized many miracles doing things that were beyond a mortal’s power. Sai baba became a great building force between the two dissimilar communities for Hindus and Muslims. He regularly do Hindu and Muslim prayers. His Hindu followers considered him to be an avatar or rebirth of Shiva and Dattatreya. All his teachings were oral and catchy. His sayings were short and crisp language with which the common crowd could easily connect. Shri Sai Baba of Shirdi was unique, lived his message through the essence of his being. He lived among the common people adorning a long coat, sleeping over a mat while using brick as his head support and got his food by begging. Sai baba’s mission was to bring back belief in god and according to him “I give people what they want in the hope that they will begin to want what I want to give them”. Sai Baba said that God is One (ALLAH MALIK EK- The only ONE). Shri Sai baba has millions of devotees in India and abroad. Shirdi in Maharashtra has become a big pilgrimage. There are over 2000 Sai temples in different parts of India and 150 abroad in places as far away in Canada, Kenya, Singapore and England. Sai baba was the common man’s God. He lived with them, slept and ate with them. The food that Baba made seemed to grow in plenty and there was always enough for everyone. Sai baba was very fond of children. He used to spend part of his day in playing, conversation with the children of the village. Sai baba’s devotees and fakirs used to dance and sing in heavenly enjoyment. Songs his sung were mostly in Persian or Arabic and popular songs of Kabir. Sai baba lived as the common man and raised a flower garden there, watered the plants, carrying pots full of water on his shoulders. The figure 9 is special and indicates the nine types of devotion are. The 15th October 1918 was a sorrowful day for the village of Shirdi, the grave hours of the noon; the favorite master suddenly breathed his last. Baba gave up his body and let his head fall gently on the shoulders. Sai baba might have left his human coil he still is alive for his devotees. He is a Living God. Even today, though he has left his coarse body, we feel his presence and obtain his loveliness and protection every day. Shirdi Sai album is made with pure intentions need not be mixed with sentiments. Shirdi Sai songs are a sound like a well-made devotional cassette brought out by a ‘devasthanam.’ The songs are applied by the MM Keeravani and KRR too. The lyrics will form part of the devotee’s collection. The singers do a fantastic job and Sonu Nigam and Hariharan come with essential surprises. Shirdi Sai songs are as follow. Sada Nimba artist are MM Keeravani and the song is for The 45 seconds. It is short devotional song and a mantra to Sai. Keeravani’s singing induces devotion. Saranu Saranu artists are Madhu Balakrishnan and Sunitha. The lyrics of saranu saranu would not come across as anything enjoyably new to the listeners of Hindu devotional songs, especially made in praise of gurus. The lines speak that the miracles that Sai is associated with in popular tales. Saranu Saranu must be a song placed in the first part of the film. The artists of this song are Akkineni Nagarjuna and Shankar Mahadevan. It begins with Nagarjuna saying ‘Sab ka Malik ek hai.’ Shankar Mahadevan words remind a sense of deja, reminding us of the Allah song from Sri Ramadasu. The lyrics of the song speak of the unity of God and religions. MM Keeravani is the artists of Nee Padamula. It speaks that his home is everywhere. Keeravani’s voice is filled with seriousness and love. Shweta Pandit has sung this song. Amaraa Raama is the really melodic song and the music is dynamic. Shweta Pandit lyrics add core to Keeravani’s tuning. Maanava Seve song is sung by Deepu and Aditi Paul. It is slow. Deepu and Aditi Paul are good in their vocal performance. Hariharan and Malavika is the singer of this song. The tune of this song is attractive for any listener. Malavika is usual best. SP Balasubrahmanyam and Sunitha are the artists of this song. The same tune was given by Keeravani. SPB and Sunitha have gloomy voices breathe life into this sad devotional song. Sonu Nigam, Teesha Nigam and MM Keeravani are singers of Datthatreyuni. The tunes are interesting and the song itself seems to be lengthy. The lyrics tell that events in Sai’s life are a fabulous manner. Sunitha is the artists of Ekkadayya Sai. It is short and tearful. MM Keeravani’s words are usual in this song. The song doesn’t have a concept different from that of the other admiring songs from the album. Keeravani’s voice seems to have been done to death. The singers are MM Keeravani and Sunitha. MM Keeravani, SP Balasubrahmanyam, Sai Kumar, Revanth, Rahul Silpigunj and Chaitra are the singers of this song. It is heart-touching and well-composed song. The voices of all the singers are good. It is more like a dialogue than a song. SPB is especially awesome. The song means that Baba just assures devotees of his presence in their lives forever. Aarathi is the most popular and beautiful song of Sai. Sunitha the singer of this song add the glamour. Sai Baba is not just a name of a person but like all gods he is one of them. There are many followers and believers of Sai Baba. As like the god Shri Krishna who has given his valuable saying or shaloks in Bhagwad Geeta for the betterment of one’s living Sai also does the same. 1. He always believes in spreading love or giving love to every living creature. 2. Sai always considers every human equal. He never differentiates people on the basis of caste or colour. 3. Sai considers every religion equal. 4. Sai always says that god is one. (Sab ka malik ek) to whatever religion we belong there is one god. 5. Sai always says that there is lot happiness in giving things to others but not just in receiving things. 6. Sai focuses on serving humanity. He says that if we human serve the humanity it is more than serving god as humans or any living creature is the best gift of god to the earth. Many of us have forgotten these saying. Today we are just busy in satisfying our own needs our own luxury, earning more and more money having valuable properties, but these saying are the best luxury one can have. The most valuable property one can have by all these sayings we can live our lives better. Sai Baba of Shirdi is the Symbol and heart of all religions. Sai Baba is all in one and one in all. Sai Baba means “discover Parents”. Sai Baba is not just a name of a person but like all gods he is one of them. There are many followers and believers of Sai Baba. realized that Baba was not an ordinary person but an extraordinary. This kind of powers was nit present in normal human beings. Sai Baba do not believed in equality of religion, caste and creed. Sai Baba did not send the poor people with the empty hand, those who came to their house. Sai Baba said that to built discipline after his death. Sai Baba was unique in this world. Sai Baba has said that success is not very important but values are. Sai Baba remains a very popular saint, especially in India, and is worshiped by people around the world. Sai baba said this famous line with special meaning “Sabka Malik Ek” means one god governs all. Sai Baba said his favorite line: Why do you fear, when I am here. Many devotees believed that he was a Sadguru. Sai Baba was dead on 15th October 1918, but he is still alive in hearts of his followers. Shri Sai Baba is one of the greatest saints ever seen in India, with unique powers, and is worshiped as a God. Sai mean Sakshaat Ishwar. Sai baba was the common man’s God. He lived with fakir (poor people) he slept and ate with them. He had no requirement of any kind. 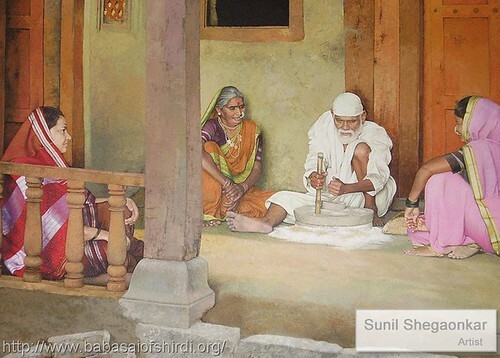 Baba used to provide food to the fakirs and devotees and even cook for them. The food that Baba made seemed to develop in loads and there was always enough for everyone. Sai Baba is not just a name of a person but like all gods he is one of them. Sai Baba is not just a name of a person but like all gods he is one of them. There are many followers and believers of Sai Baba. Sai Baba has no religion there are many followers and believers of Sai Baba. Sai Baba has no religion to His devotees. Sai Baba is nothing less than a God. Sai Baba said this words to their followers “I look at everybody with an equal eye”. It means that Sai Baba looks everyone with equal eye; all people are same for him. Baba used to take care of His children day and night. Sai Baba’s every word is an action. These are collection of Sai baba images collected from internet and other sources. If you have any image to add in the collection kindly mails us. Sai Baba photos are very different from original photos. The photos of Sai Baba are clear in original. Some of the photos old and new are listed below. Om Sai Ram. Shirdi Sai Baba temple located at Shirdi has great importance among followers of Sai Baba. This temple attracts many devotees of all castes and religion who come to Shirdi to worship Sai Baba and to give homage to Sai Baba. It is a beautiful temple built over the Samadhi of Shri Sai baba. Administration of this temple and other temples located in the premises is done by Shri Sai Sansthan. This sansthan controls and manage the day to day activities at the Sai temple. Facilities of lunch for the tourists are also made available by this Sansthan at Sai temple. You will really feel heavenly by having darshan of Sai baba at Sirdi Sai baba temple. You will see the pure calmness at glance in the statue of Sai baba made of white marble. It will take you to the spiritual journey that will give new meaning to your existence. Timings of darshan of Sai baba in the temple are fixed by the authorities and you will find so many people waiting in a queue for their chance to get in. This temple opens for the public at 5 AM in morning. You have to reach there at 4 am because after that you will find a long queue. At this time a melodious prayer ‘Utha utha sakla jana’ is played on audio cassette in the temple. Kakad aarti starts at 5:15 a.m requesting Sai baba to wake up and to give his blessings to everyone. Statue of Shri Baba is offered mangal snan after this mangal aarti. This snan is done by milk, curd, sugar, honey, ghee and warm water. After this Shodashopchar pooja is done and then you can have full darshan of Sai baba from 7:10 a.m. Mahadhayan aarti is performed at noon and Dhup aarti is performed at the time of sunset. Sai Baba of Shirdi was an Indian guru and yogi who taught a lesson about love, kindness, forgiveness, devotion to God and inner peace. Both Hindu and Muslim devotees give him regard as a saint. According to many Hindu devotees he is an incarnation of Lord Dattatreya. He is very popular among people and his devotees are not only from India but from all over the world. So many devotees come to Shirdi every year to get blessings of Sai baba. There are so many songs made in regard of Shirdi Sai Baba. These songs are very pleasant and give relaxation to mind and soul. You will definitely find blessings of Sai Baba with you while hearing these songs. These songs will also give you the messages of Shirdi Sai Baba and also tell you about the teachings given by him. These songs will create the environment of Shirdi at your home and will give you relief from all your tensions. CD’s of Shirdi Sai Baba songs are available easily in market or you can also download these songs from internet. There are websites on which all types of Shirdi Sai baba songs are available for free. So, play these songs and take the name of Sai Baba. You will get rid of all your sins.